The bathroom is one of the most frequently used spaces in your home, so if you're going to be spending a majority of your time there, shouldn't you enjoy it? According to The Republic, many homeowners are embracing comfort as the driving force behind their bathroom designs, and it's much easier than you may think. We all have a mountain of toiletries on our bathroom vanities, such as mouthwash, soaps, bath salts and shower gels, so why not make them into an attractive display? Use an elegant silver or ceramic tray and arrange all of your bath products into a brilliant mixture of decorative hues that will become a focal point in your bathroom. If your mirror is lacking flair, this could be a quick upgrade that can make or break the aesthetic of your washroom. Opt for an oversized mirror to fill up a bare wall or go with an item that features an ornate frame. Either design will add a dynamic accent to your bathroom that you will enjoy for years to come. Improving the overall feel of your bathroom will enhance its comfort level and help you put your personal stamp on the space. 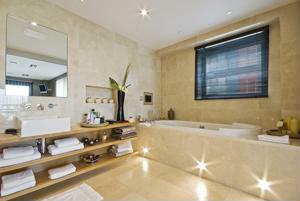 What comfort-related items do you suggest for bathroom decorators?